By default, Watermark CC will be installed through the Creative Cloud app. It may happen, however, that this does not work. Please follow this instructions step by step. After a few seconds Watermark CC should be installed automatically through the Creative Cloud App. If the installation is successful you will receive the notice “You have installed the Add-on Watermark CC”. • Synchronisation is turned on. To check this click in the Creative Cloud App on the three dots on the upper right corner and click on “Preferences”. Change to the tab “Creative Cloud” and then to “Files”. Restart Photoshop. You can find the Panel here: „Window“ -> „Extensions“ -> „Watermark CC“. After a few seconds Watermark CC Pro should be installed automatically through the Creative Cloud App. If the installation is successful you will receive the notice “You have installed the Add-on Watermark CC Pro”. Restart Photoshop. You can find the Panel here: „Window“ -> „Extensions“ -> „Watermark CC Pro“. If you have the free version of Watermark CC also installed there are 2 separate entries (“Watermark CC” and “Watermark CC Pro”). Click on “Download Watermark CC”. This will let you download the zxp-file. I recommend Anastasiy’s Extension Manager. Download it by clicking on the link. 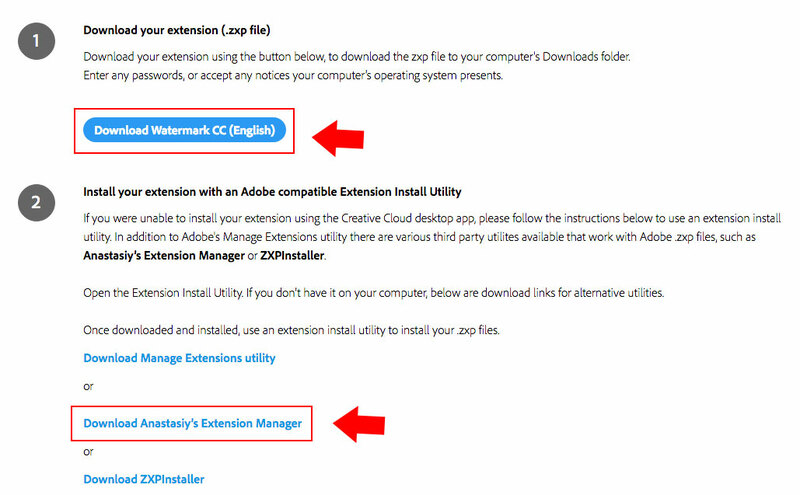 In Anastasiy’s Extension Manager click on “Install” in the left upper corner and choose the zxp-file that you downloaded before. Click on “Download Watermark CC Pro”. This will let you download the zxp-file.